When searching for suggestions of how to propose to the love of your life, some may recommend sharing the sunset on a beach, while others insist on flashing lights at a ball game. For the traditional folk, a nice romantic restaurant will suffice. Karma Asian Food & Fine Wine (510 East Route 83, Mundelein, Ill.) was the perfect spot for a soon-to-be fiancé who was searching for ideas on LTH Forum. When he asked for advice of where to propose, Karma topped the list for romantic restaurants in Chicago’s Northwest suburbs. Looking for a location to propose, or somewhere to dine with someone special? Check out the Pan-Asian eatery, Karma. Karma’s elegance and sophistication will be sure to impress the one that means the most to you. Dine with a tranquil waterfall in the background and cone-shaped glass replicas of salt harvesting in the pond. The wooden tables are topped with Western flatware and stainless steel chopsticks giving the restaurant a contemporary, yet traditional feel. 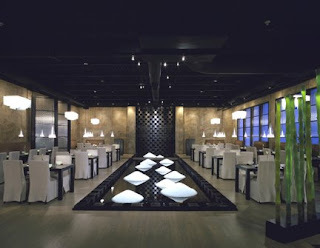 Karma’s elegance doesn’t stop at the décor; its gourmet food is just as striking. For the remainder of July, Karma is offering a prix-fixe meal every Friday through Sunday for just $20. For the appetizer, pick from either the Miso Soup, tofu, sautéed shitake mushrooms, scallions and roasted nori; or the Karma House Salad, crisp lettuce, napa cabbage, cucumber, daikon and carrot ginger dressing. For the main course, choose from Orange Peel Tempura Chicken, sesame jasmine rice, ginger chili cucumber salad and yuzu orange glaze; Asian BBQ Salmon, forbidden rice, sweet potato crisps, wok tossed spinach, napa cabbage and shiitake mushroom; or the Yellow Mango Vegetable Curry, spring vegetables tossed with coconut yellow curry, jasmine rice and kimchi. Finish up the meal with a Trio of Sorbet or Ice Cream, served with fresh berries. Whether proposing, celebrating a birthday or just going out for a romantic evening, dining at Karma will be an unforgettable experience. For more information, visit www.karmachicago.com, or call (847) 970-6900. To see the LTH Forum post click here.